REGION 4— The Region 4 Board of Education Tuesday accepted and released an investigative report that denies reports a gag order was imposed on students at Valley Regional High School before and after the Oct. 12 resignation of Principal Eric Rice. The four-page report prepared by Madison lawyer Stacey Lafferty declares there is “no evidence or support for the claim that a gag order was issued or sanctioned by Central Office,” or that the First Amendment rights of students or faculty were suppressed or violated. But the report suggests that some students may have believed there was a gag order after Rice cautioned them not to attend a Sept. 23 rally outside the district’s Central Office that was organized by supporters of Rice. The board met in closed session for about 45 minutes with its attorney, Kevin Roy with the Hartford firm of Shipman & Goodwin, before voting without discussion to accept and release the report. Board member Richard Strauss of Chester, who is Rice’s father-in-law, exited the room midway through the closed session and returned for the brief public session. The board hired Lafferty to investigate reports of the gag order, an allegation that was included in complaints filed last month by Essex resident Susan Magaziner with various state and federal agencies, including the U.S. Department of Education Office of Civil Rights. District lawyers had recommended the board sponsor an independent investigation of the allegations. Lafferty states in the report that she interviewed Magaziner on Nov. 21, and on Nov. 22 visited the high school and interviewed three administrators, eight faculty members, three students, and one athletic coach. Lafferty said she “contacted Rice by telephone and left a message with his wife” on Nov. 23, but received no call back from Rice. The report states that on Sept. 23 Rice asked one faculty member to urge students not to attend the rally supporting him that had been announced for that day. 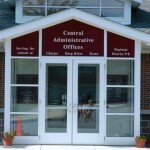 Three faculty members indicated there was no gag order imposed by the top administrators at Central Office, Superintendent of Schools Ruth Levy and Assistant Superintendent Ian Neviaser. The report states that another teacher told students not to discuss the circumstances of Rice’s departure in class because they did not have complete information on the situation. Rice, a Chester resident who was hired for the principal job over the summer, resigned on Oct. 12, receiving $62,150 in severance pay and extended health insurance coverage. The board of education named Kristina Martineau, the assistant principal at the high school, as acting principal for the remainder of the school year. At the time of the Sept. 23 rally, there were rumors that Rice had been given a resign-or-be-fired ultimatum by Levy, who has declined to comment on the circumstances of Rice’s departure. Magaziner said Wednesday she does not believe Lafferty’s report provides a complete and accurate recounting of events at the high school. Magaziner said she is providing information to an attorney with the Boston office of the U.S. Department of Education, Carol Kennedy Merrill. She said Merrill is talking to parents and students about the suspension of the student, who is Asian.